A single option supported by an ACL: -x[=value] or –name[=value] Unlike a parameter flag, this option applies to all ACL parameters. Definition at line 39 of file Options.h. Definition at line 42 of file Options.h. Definition at line 43 of file Options.h. Definition at line 44 of file Options.h. References configured(), configureDefault(), configureWith(), print(), and valued(). 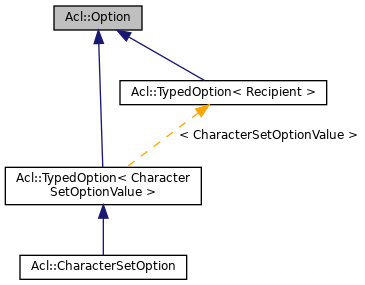 Implemented in Acl::TypedOption< Recipient >, and Acl::TypedOption< CharacterSetOptionValue >. Referenced by Acl::OptionValue< CharacterSet >::operator bool(), Acl::OptionsParser::parse(), and ~Option(). Referenced by Acl::OptionsParser::parse(), and ~Option(). Implemented in Acl::TypedOption< Recipient >, Acl::TypedOption< CharacterSetOptionValue >, Acl::TypedOption< Recipient >, and Acl::TypedOption< CharacterSetOptionValue >. Referenced by operator<<(), and ~Option(). Referenced by operator<<(), Acl::TypedOption< CharacterSetOptionValue >::print(), and ~Option(). Definition at line 61 of file Options.h.